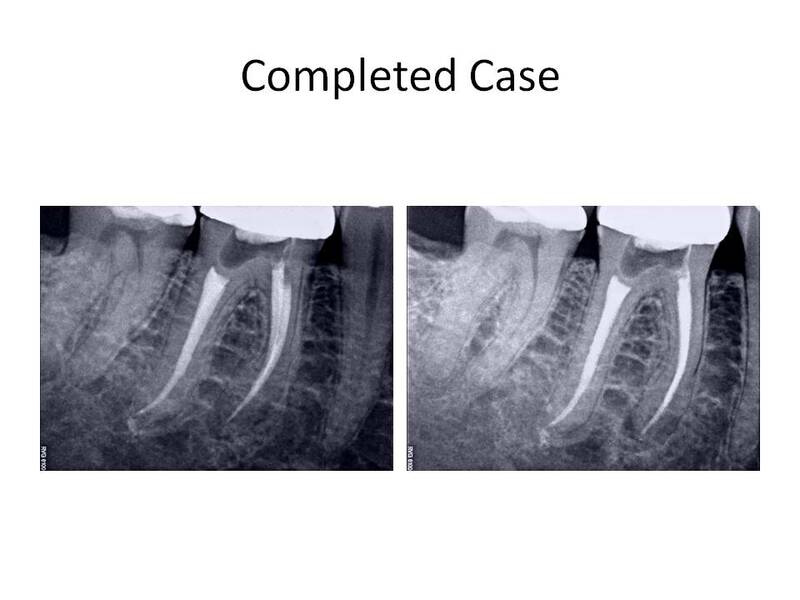 This month, I am presenting a retreatment case that proved to be more challenging than I imagined. The patient is a 53 y.o. male who was referred for an evaluation of tooth #30. He was asymptomatic at the time of initial examination. His medical history was non-contributory. The dental history was as follows: He had the root canal treatment performed approximately 10 years ago by his dentist at the time. He was recently seen by his dentist who noted that the root canal treatment was less than ideal and that there was an apical pathosis associated with the mesial root. Clinical exam reveals that tooth #30 has a PFM crn present, negative percussion or palpation tenderness, normal periodontal probing depths. 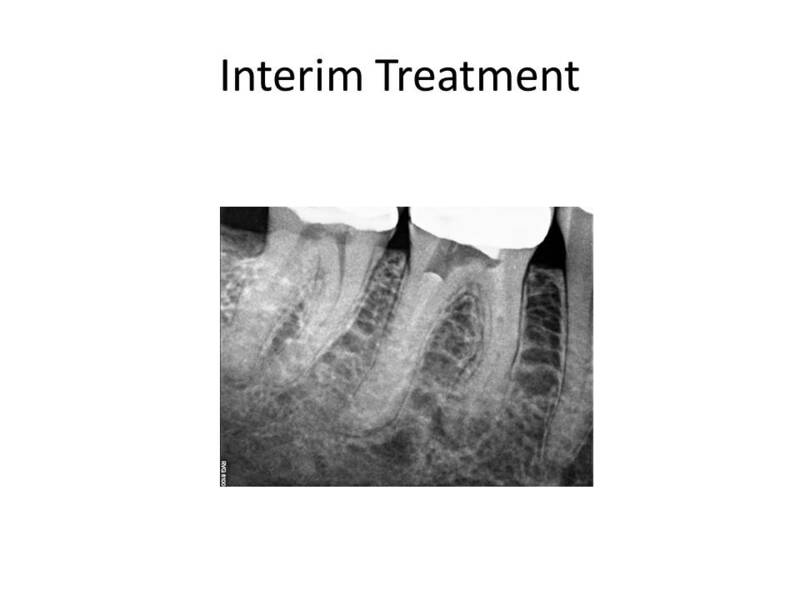 Radiographic examination reveals that the tooth has had previous RCT, there is a threaded post present in the distal root. The obturation of the mesial and distal canals is well short of the radiographic apex. The distal root appears to have been obturated with a carrier based material, the mesial root reveals ill-fitting master cones based on their curled appearance. There is a RL lesion associated with the mesial root. 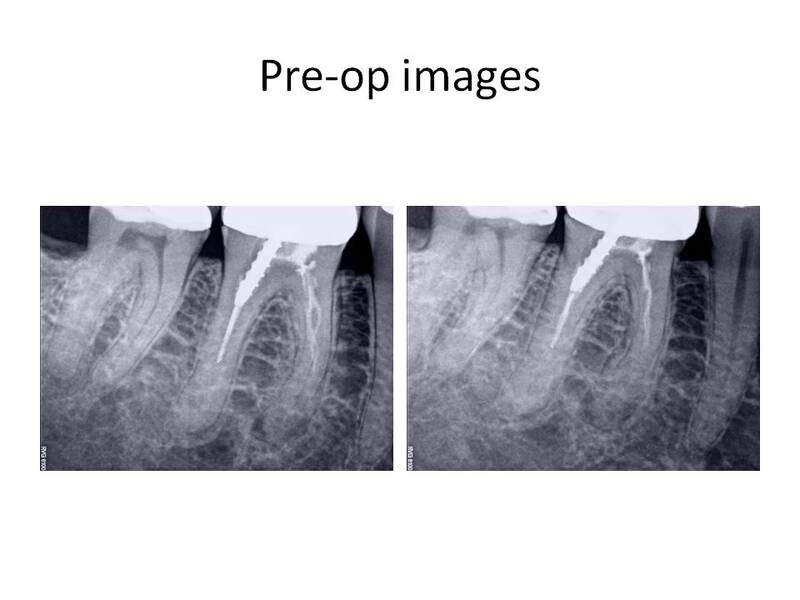 The radiographs are as follows: . The clinical diagnosis is Previously treated #30 with asymptomatic periapical periodontitis. This case demonstrated a challenge to canal negotiation. Proper technique and an understanding of my goals was essential in order to properly treat the case. Certainly, I could have initally opted for a root end resection. However, I felt fairly confident that I could manage the retreatment without having to go to an apicoectomy. I welcome any comments or feedback regarding this case. Thank you again for entrusting my office with the care of your valued patients. At Wedgewood Endodontics, we are proud to help save your natural teeth through root canal therapy. We are very excited to have you as a patient and to serve you with the best care possible.